LEDiL has a full ecosystem of System Reflectors available as standard parts. The ecosystem consists of three interfaces each with its own compatible families. All three ecosystems share LEDiL’s philosophy of easy optical component interchangeability. 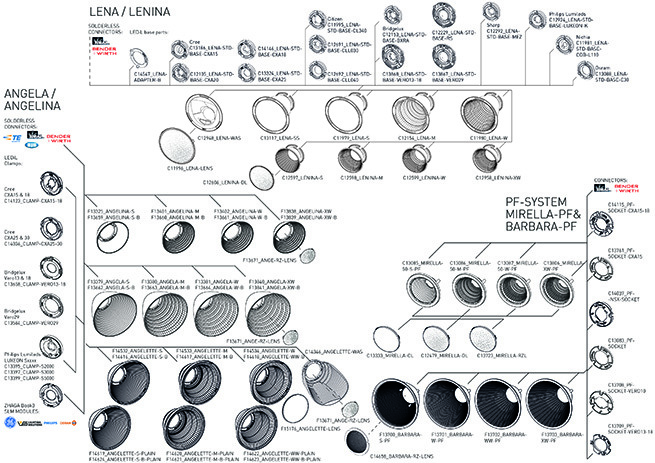 Whether your choice is LENA/LENINA, MIRELLA-PF/BARBARA-PF or ANGELA/ANGELINA – we offer full luminaire configurability during the last stages of manufacturing. Each of these three systems offer optical interfaces for a range of COB’s from most LED suppliers and have a full range of optics from narrow spot to wide flood. For flexible design options and a minimized time to market – design in System Reflectors. LEDiL has qualified it’s ANGELA and ANGELINA families to be used with Cree’s CXA35 family of COBs together with IDEAL solderless connector.